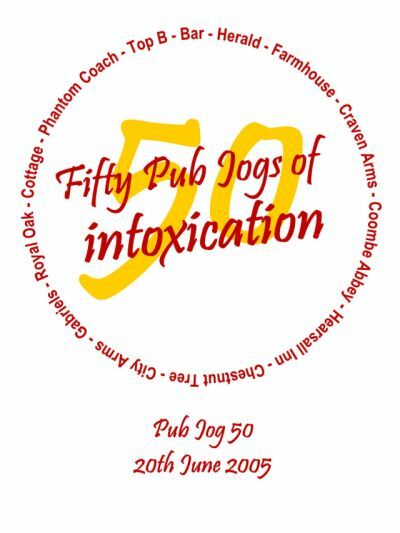 This small page is to commemorate the 50th Pub Jog which happened on 20th June 2005! To be honest I don't remember much about it, but it was such a milestone in the history of Pub Jogs that it deserved a little bit of extra prominence! Roll on Pub Jog 100! In the same year as Pub Jog 50 the University was rather conveniently celebrating it's 40th Anniversary... with suitable corporate logo. The opportunity was too good to miss! George Bush (snr.) took over from Ronald Reagan as US President . Mikhail Gorbachev was General Secretary of the Soviet Union . Margaret Thatcher was Prime Minister . Tony Blair was Shadow Energy Secretary, Michael Howard introduced the “Poll Tax” . Steve Davis ruled supreme in snooker . “Die Hard “and “Who Framed Roger Rabbit” were big hits in the cinemas . Star Wars was still a trilogy . Ben Johnson was stripped of his Olympic gold medal in Seoul . But Florence Griffith Joyner kept hers… . GBR Olympic athletics medallists were Linford Christie, Liz McColgan, Peter Elliot, Colin Jackson, Fatima Whitbread, Mens 4x100 (all silver), Yvonne Murray, Mark Rowland (bronze) . Meanwhile Eddie “The Eagle” Edwards became a famous GB Olympian for being crap . Ingrid Kristiansen won the (women’s) London Marathon in 2:25:41 . The Student Union had the Mandela, Rosa’s, Harvey’s and Cholo Bars, Elephant’s Nest and The Market Place . Grumpy John was still working in the SU . Nelson Mandela was still in prison . The DNA sequence is obtained for herpes . Mike Tyson becomes undisputed heavyweight champion of the world . Pan Am Flight 103 blown up by Libyan terrorists over Lockerbie . Dustin Hoffman (Rain Man) and Jodie Foster (The Accused) win Oscars . Warwick Uni Mens Cross Country team get promoted to Div 2 of the Birmingham League . Construction begins on the Channel Tunnel . Iraq comes out on top in the Iran-Iraq War (with a little help from the USA) . The first GCSE exams were held . Al-Qaida established by Osama bin Laden . Stephen Hawkins book “A Brief History Of Time” is published . Stefan Edberg beat Boris Becker in the Wimbledon final, Steffi Graph beat Martina Navratilova . 30 pound a week for a room in the newly built Jack Martin Halls was considered steep . Berlin still had a wall . Section 28 was passed as law by the British Parliament . Dr. Dave started at Warwick University . The Sega Megadrive was released in Japan . FA Cup final: Wimbledon 1, Liverpool 0 . But Liverpool were the Division One champions ahead of Manchester United and Nottingham Forest . Holland beat USSR in the European Cup final after England lost ALL their group stage matches . Gary Linekar was an England player and didn’t advertise crisps . Ayrton Senna narrowly beat his team-mate Alain Prost to the F1 Drivers Championship (McLaren-Honda) . Kylie ruled the charts with hits such as “The Locomotion” and “I Should Be So Lucky” . Nirvana release first single, but no-one’s heard of them here yet . Bros didn’t know the answer to “When Will I Be Famous”, I guess we all know the answer now… . The first Pub Jog took place around Earlsdon, to become the stuff of legends in the Warwick Uni Athletics and XC Club .